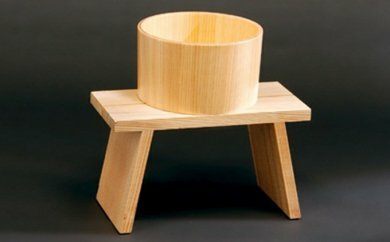 Using Nikko Cedar, this is a Stool and Bucket set for bathing. Traditionally, buckets have a copper ring to keep the wood in place, but we've used professional techniques to keep the wood in place through special fitting, making it look smooth and simple: A hybrid of modern design and traditional techniques. The Bath stool is straight-lined and simple, with a sharpened shape and elegant finish. On legs is a slip-resistant rubber piece, carefully designed by craftsmen.